The third and last book in the Jon Shannow series sees us twenty years after Shannow caused the fall of two worlds. Shannow is now a very different man. 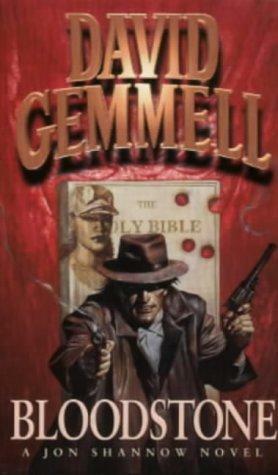 He has turned his back on violence and bloodshed, becoming a preacher in Pilgrim's Valley, the few people who knew him well allowing the "Jerusalem Man" to fall into legend, to allow Jon Cade another chance at a peaceful life. Even the world around them has become a very different place. It is now ruled by the Deacon, a man freed from stasis in one of the planes caught around the Sword of God. Taking the legend of the Jerusalem Man he has used it to bring himself into glory. Most believe that he brought peace and unity to the land. Only a handful see the evil of his wholesale genocide of the second Hellborn nation, in his Jerusalem Riders, who kill unbelievers, and in his persecution of the Wolvers. For most it has just become about keeping their heads down and finding a way to survive, but with Saul, one of the Apostles that descended with the Deacon, angling to grab control, an ill-advised attack on Preacher Cade's church awakening the Jerusalem Man still inside of him, and an insatiable, blood-eating demon from an alternate time-line looking for more souls to feed on, survival may no longer be an option. There were some parts of this book that felt rushed and, again, I think that has a lot to do with so many plot-lines being written in a relatively short book. The time travel stuff made my head hurt a little bit more this time around, with all the inevitable questions that arise to form complex paradoxes that I'd rather not think about anymore. Despite that, I really enjoyed this book. A good and satisfying conclusion to an enjoyable series. And there was even a shock that, for once in this series, I didn't call.